In his books, Joe Sacco always draws himself the same way: neat and compact, a small bag slung across his body, a notebook invariably in his hand. At a single glance, the reader understands that he is both reporter and innocent abroad, an unlikely combination that propels him not only to ask difficult questions, but to go on asking them long after all the other hacks have given up and gone home. You sense in this black-and-white outline, too, a certain taut, physical alertness. Should there be trouble, he is, it seems, ready to run. The expression on his face, however, is more difficult to read. Sacco keeps his eyes permanently hidden behind the shine of his owlish spectacles; anyone wishing to gauge his deeper emotions must rely instead on his bottom lip. Basically, this lip has two modes. When he is frustrated, bewildered or angry, it moves stubbornly forward and its corners droop. When he is happy, contentedly drinking beer, say, or mildly flirting, it peels back to reveal his teeth, which are big and rabbity and exceedingly un-American, as if crafted from a piece of old orange peel. Is his eyelessness intended to send some kind of subtle message regarding the reliability of the reporter-narrator? Sacco, who in real life has elfin features and brown eyes, and is sitting next to me at a gleaming white table in the offices of his London publisher, winces. "It is deliberate now," he says. "But it certainly wasn't in the beginning. If you look at the first few pages of [my first book] Palestine, you'll see that I didn't used to be able to draw at all! Also, back then, I really was more like a tourist than a reporter and I suppose the way I drew myself reflected that. I was this naive person who didn't know where he was going or what he was doing. Since then, I've learned how to behave; nowadays, it would be a lie to make myself seem too bumbling. "But some people have told me that hiding my eyes makes it easier for them to put themselves in my shoes, so I've kind of stuck with it. I'm a nondescript figure; on some level, I'm a cipher. The thing is: I don't want to emote too much when I draw myself. The stories are about other people, not me. I'd rather emphasise their feelings. If I do show mine – let's say I'm shaking [with fear] more than the people I'm with – it's only ever to throw their situation into starker relief." Thanks to publishing hyperbole, writers often get called "unique". But Sacco's work truly is, combining as it does oral history, memoir and reportage with cartoons in a way that, when he started out, most people – himself included, at times – considered utterly preposterous. Twenty years on, though, and the American cartoonist is widely regarded as the author of two masterpieces: Palestine, in which he reported on the lives of the inhabitants of the West Bank and Gaza in the early 1990s, with flashbacks to 1948, the beginning of the first Intifada, and the first Gulf War; and Safe Area Gorazde, which describes his experiences in Bosnia in 1994-95. 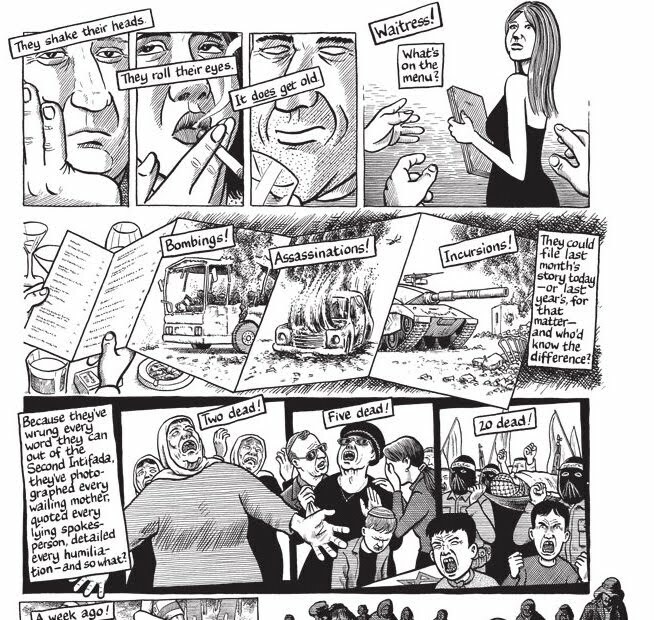 Palestine won an American Book Award, and has sold 30,000 copies in the UK alone (this is a huge figure for a comic book, let alone a political comic book). "With the exception of one or two novelists and poets, no one has ever rendered this terrible state of affairs better than Joe Sacco," wrote Edward Said in his foreword to the complete edition of Palestine (it was originally published as a series of nine comics). Safe Area Gorazde, following ecstatic reviews in which Sacco was named Art Spiegelman's heir apparent and tipped to win a Pulitzer, won the 2001 Eisner Award for best original graphic novel. Footnotes in Gaza, his new book and his first long narrative for six years, returns Sacco to Palestine and, being rooted as much in the past as in the present, is perhaps his most ambitious work to date. But why go back? Aren't there plenty of crises to report elsewhere? He shrugs. All he knows is that, a few years ago, he felt a fresh "compulsion" to write about Gaza; events in the territory had left him feeling "agitated". So in 2001, he and journalist Chris Hedges travelled there on assignment for Harper's magazine. The idea was that they would go to one city and focus on its history alone. Sacco suggested Khan Younis. In the back of his mind, he dimly remembered something he had read in Noam Chomsky's book, The Fateful Triangle, about an incident during the Suez crisis in 1956 in which a large number of Palestinian refugees were killed by Israeli soldiers. "We asked around, people confirmed the story, and we thought it important for the history of the town," says Sacco. "But when Chris's piece was published, they cut Khan Younis out. Well, that further agitated me. I know the big picture is important but the big picture is made up of a lot of smaller things. It's a shame when those things get lost. It seems… unfair. I wanted to look at it myself. According to the UN, 275 people died in Khan Younis: why did that figure deserve to return to obscurity?" In 2003, he went back. But once there, Sacco found himself becoming increasingly interested in another incident that had occurred around the same time – November 1956 – in the neighbouring town of Rafah. According to a couple of sentences in a UN report, scores of Palestinian civilians had also been shot by Israeli forces there during a procedure that should have been standard (the Israeli soldiers were screening Rafah's men in the hope of finding terrorists). Sacco wanted to know what had happened. Had the Israelis, as the UN report surmised, simply "panicked and opened fire on the running crowd"? Or was it more complicated than that? Moreover, what effect had this incident had on the collective memory of Rafah, now once again in brutal conflict with the Israeli army? In Rafah, almost all men of military age had reputedly been caught up in the incident so there were likely to be survivors still living whom he could interview at length. As a result, Footnotes in Gaza is divided in two. A first, shorter section investigates the killings at Khan Younis, and a second, longer section is devoted to events in Rafah. "Both towns stand in for all those places, all those things, that are more widely left out of history. They're footnotes, but these were also an important day in some people's lives." Footnotes in Gaza features all Sacco's trademarks. For a start, there is the author himself, one minute infuriated beyond all endurance by checkpoint bureaucracy, the next delightedly scoffing honeyed Arab pastries; unlike many reporters, Sacco is as interested in the process of getting the story as in the story itself, a fact which only serves to remind you of how highly filtered and polished most "news" is. Then there are the people he meets. Sacco's ear for the way Palestinian men talk is as sharp as ever (as Edward Said has put it, they exchange their tales of suffering the way fishermen compare the size of their catch). Ditto his nose for lies and embellishments. As usual, his fixer – this time, his right-hand man is called Abed – takes a starring role, his tenacity seeming to surprise even his employer at times. Best of all, there are the moments when Sacco covers a page with one or two large frames, these bigger, more panoramic drawings capturing not only the claustrophobic scrum of a single, 21st-century Rafah street, from aerials on corrugated tin roofs down, but also the way it might have looked when Palestinian refugees arrived there in 1948 (he used old photographs as the basis for these drawings and has rendered the land dry, empty and bleakly forbidding). But Footnotes is also a darker, less humorous book than Palestine; Sacco calls it "sombre". It's not only that the old men and women he interviews are describing such painful events. Footnotes is punctuated by a sense of history repeating itself or, perhaps, of history failing ever to stop, not even for the merest breather. As someone in Gaza tells Sacco: "Events are continuous." You look at his drawings of hundreds of men sitting in a pen one day in 1956, under armed guard, no food, no water, their hands on their heads, and you could be looking at an equivalent atrocity at almost any time before or since, and in any number of places. "There are only so many ways you can skin a cat when it comes to screening people so you can kill them," says Sacco. "It was a horrific incident in and of itself but it is also representative of any number of other incidents, even if I'm reluctant to make direct comparisons myself." Meanwhile, life in present-day Gaza grinds on. We see Sacco and his room-mate, Abed, listening to mortar fire, braving the curfew (the book is set before the Israeli withdrawal from Gaza) and witnessing the demolition of homes. The book is haunted by a ghostly presence called Khaled, a man wanted by the Israelis. Always on the move, he has not had a proper night's sleep for several years. In Sacco's drawings, Khaled's features – his hawkish nose and long chin – cast impossibly long shadows over the rest of his face, leaving the reader unnervingly unsure whether he is to be feared or pitied. Joe Sacco was born in Malta in 1960. His family emigrated, first to Australia and then, finally, to America when he was just a boy; his parents, who were socialists, were worried about the influence of the Catholic church on Maltese life. Sacco believes that the experiences of his parents had a big impact on his career. "In Australia, there were a lot of Europeans and they would all meet up and the commonality was the war. You heard a lot about it. I guess I realised conflict was just a part of life." He decided to be a reporter and did a journalism degree at the University of Oregon (he still lives in Portland). His early jobs, however, were so indescribably boring – he worked initially for the journal of the National Notary Association – that he soon decided he'd be better off working for himself. First, he set up his own comics magazine. Later, he had a staff job on the Comics Journal. As far as his own drawing and writing goes, his influences include George Orwell and – this makes such perfect sense – Bruegel. It was in the early 1990s, while he was living in Berlin, that he became interested in the Middle East. "I didn't have some grand plan. I just felt like I needed to go there and see for myself. It's so under-reported in America. At the time, I was trying to make a living as a cartoonist. I thought to myself: I can't just be some adventure tourist but maybe it is conceivable that I could do a comic about it. But I didn't even know if I would have the guts to go into the West Bank! This is how naive I was: I was bumbling around in East Jerusalem for a few days and I met a tourist who'd been to Nablus in a taxi. Oh, I thought: I could just get a taxi! I was pretty sheepish about telling people what I was doing. If I met a journalist or someone from an NGO, I was always afraid they would laugh – and one or two did." Did he seriously believe he could make a living from this kind of work? "I'll be honest. I thought it was commercial suicide, writing about Palestine. I was cutting my own throat! It came out in nine issues and each one sold progressively worse. The last one sold under 2,000 copies in the US. That's when I thought: OK, I really made a mistake. When I did the next book [Safe Area Gorazde], I decided to do it as a single volume, simply so I wouldn't get demoralised as I went along." It was Safe Area Gorazde that changed his fortunes. "Most American journalists agreed with my position on Bosnia and it was incredibly warmly received. The New York Times named it a notable book of the year and I received a Guggenheim fellowship, which really helped me financially. So when Palestine came out in a single volume, it had a new life. It sold 60,000 copies in America and it was widely translated. It has long since outsold Safe Area Gorazde. I think it'll be the book I'm remembered for." In the years since, Sacco has published several more tales from Bosnia, among them the brilliant The Fixer: A Story From Sarajevo, and he has reported from Iraq and Ingushetia for newspapers and magazines. He is now at work on two projects: a 48-page comic for the Virginia Quarterly Review about African migrants who attempt to get into Europe via Malta, and a story for Harper's about Camden, New Jersey, currently the poorest city in the US. When he's not travelling, he treats his work "exactly like a proper job… I have to: Footnotes in Gaza took me four years. I have to produce at a certain rate and stick to a rigid two pages every five days. I don't story-board. I hardly even sketch anything out. I draw directly on to the board with my pencil. It's all hand-drawn. If I make a mistake, I cut out the panel and cut and paste the old-fashioned way". Nevertheless, he is often away from home for long periods. In his books, he sometimes depicts himself gazing dreamily at a pretty girl in a bar. Has his career played havoc with his private life? "It played havoc with my life until I was almost 40. I have a girlfriend now and a mortgage, which feels pretty odd, but for about a 10-year period I was just so broke. I had to ask friends and my parents for money. It's difficult to have a personal life when you're broke because you can't afford to go out, and it isn't that attractive, either; people get fed up pretty quickly." It seems to me, though, that Sacco must be quite tough; even when things are at their most difficult in Gaza or Bosnia, they never really seem to get him down. "Well, I know I'm going to leave," he says. "If I knew I was trapped the way people in Gaza are trapped, their lives simply closed down, maybe I would go insane. That's not to say that my stomach doesn't get a little twisted up as I'm going in and as I'm leaving. I love Gaza. I wouldn't say I see physical beauty in it. It's more to do with its people and my experiences with them: that physical closeness that you can't really avoid. Things are so hard there but – wow! – they always feed me the most amazing food." Still, for the "sake of my own sanity" he is planning on stepping away from war reporting in the near future. He is planning a graphic memoir about the Rolling Stones. Will he one day return to Gaza for a third time? Or perhaps he could look at the conflict from Sderot or some other town on the Israeli side. "It depends on what I feel in my gut. There are lots of places in the world where things are pretty bad. When I read about them, though, I have to wait for the story to work on me. With Bosnia, it took a full year for that to happen. But I do feel Palestinians have been misrepresented in the America media over a long time; we've internalised all sorts of things about them. "With Footnotes, I want people to appreciate the lost molecules of conflict: the details and sideshows that only exist until the people who remember them die. But I also want them to remember, when they're watching the news, that it comes to them out of context and that history always comes back to haunt you. An incident can resonate for a whole century or even longer." As he considers the weight of all those years, his eyes narrow and I think to myself how good it is to be able to see them at last.